1) Just one serving of turkey provides 65 percent of your recommended daily intake of protein. Eat a turkey sandwich for lunch and you’ll almost have your daily protein covered! 2) Turkey contains trace minerals thought to aid in cancer prevention. 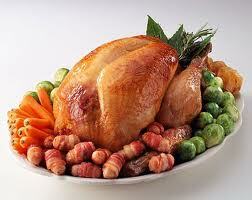 Turkey contains selenium, which is essential for the healthy function of the thyroid and immune system. Selenium also has an essential role to play in your antioxidant defense system, helping to eliminate cancer-friendly free radicals in the body. 3) Turkey is considered a good source of vitamins B3 and B6, rated because of the density of these vitamins in the meat. A serving of turkey meat has 36 percent of the daily allowance of B3 and 27 percent of your recommended intake of B6. So Gobble up that left over Turkey!